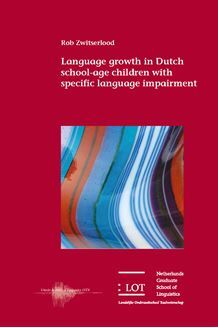 Rob Zwitserlood Language Growth in Dutch School - Age Children with Specific Language Impairment In this dissertation , the results of a longitudinal study of two age - groups of Dutch - speaking children with specific language impairment ( SLI ) and an intervention study examining a metalinguistic approach for older school - age children with SLI are reported . Grammatical development of school - age children with SLI between the ages 6 and 10 years was investigated in narratives with a wide range of measures of grammatical complexity and grammatical correctness . The grammatical profile that was obtained from the grammatical analysis was used to select appropriate targets for the intervention study . In addition , speech fluency was examined in the children with SLI aged 8 - 10 years . Speech disfluencies can offer a window into formulation difficulties of older children with SLI , even when sentences are produced grammatically accurate . Grammatical complexity and grammatical correctness in the children with SLI show a continuous development between the ages 6 and 10 years . In addition , the higher speech disfluency rates in children with SLI reflect their compromised expressive language skills . The higher disfluency rates at word - initial positions suggest that difficulties with lexical retrieval contribute to the speech disfluencies . Furthermore , a five week intervention program with five hours of individual therapy yielded significant progress on relative clause production in children with SLI of 10 years of age and older . This dissertation is of relevance to researchers in the fields of language acquisition and language disorders , as well as to clinicians working with language impaired children .